Ramsey Feagai, the Rams' 6-foot-2, 330-pound senior offensive lineman who has a passion for drawing, showed off a sample of his work. STRENGTH and size are nice. An agile mind and body, however, are even nicer. 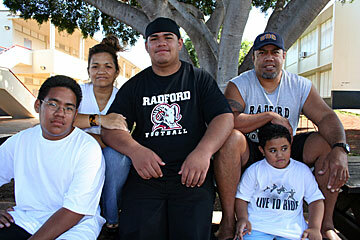 Ramsey Feagai is nimble in more than one way, and that's what separates the Radford offensive lineman from the crowd. For a long time, the 6-foot-2, 330-pound senior has loved to draw. He won't boast about his abstract-themed art -- the craft of drawing people is still new to him -- but Feagai will take a pencil to paper on a whim and create. "Everything I draw is off the top of my head," said Feagai, whose mammoth hands make pencils look like toothpicks. His latest effort is a cross with scripture wrapped around it. Over the past three years, he has drawn for the award-winning Radford graphic arts department. He has produced, along with teammate and computer whiz Ian Scheuring, art for a school T-shirt as well as a centerpiece on the John Velasco Stadium field. The patience and diligence involved with his art carry over to football. For the past two years, he was just a face in the crowd -- Feagai's own description -- at the Speed and Quickness camps held at the University of Hawaii. An older cousin, former Farrington standout Paulo Feagai, would drive each time. "The agilities and plyometrics, they're about coordination," Feagai said. "I think the footwork drills really helped me out. If I didn't have that, I don't think I'd have this many offers." UNLV has been very interested, offering a scholarship and suggesting to Feagai that a season of wrestling will make him even better. So, Feagai is wrestling for the first time, not to compete, but to improve himself. New Mexico State, however, is higher on Feagai's short list of possible colleges. The Aggies have a number of island players plus a non-football attraction. "They have a good graphics program," Feagai said. 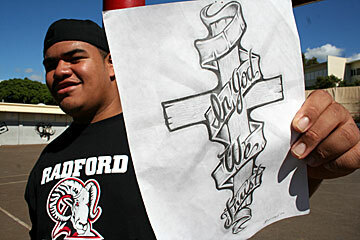 The best graphic arts program, he added, is at Arizona State, which has shown no interest. Ramsey Feagai is flanked by his mother Ola, back left, and father Laau. His brother, Ransen, sits in front of mom, and another brother, Trey, is with dad. Beyond art, Feagai's top choice so far is a latecomer. Hawaii coach June Jones saw Feagai at the first HUB Goodwill Senior Bowl practice and was sold. "June Jones said that Ramsey had the best feet of the O-linemen at the all-star game," said Radford coach Fred Salanoa, who led the Rams to the OIA Division II championship this year, their first league title since 1981. FEAGAI'S UNCLE, David Faleafine, started at linebacker for that 1981 team. Current assistant coach Thor Salanoa was one of the standouts on that squad during the late Velasco's final season as coach. The past few weeks since the end of the season have given Feagai time to rest and think. He passed on an opportunity to play in Samoa Bowl III on the advice of his dad. "I didn't want him to go. He doesn't need unnecessary injuries," Laau Feagai, Ramsey's father, said. Laau Feagai played at Farrington, graduating in 1979. He would love to see his son remain home for his collegiate career. "Having June Jones offer him a scholarship personally, that was something else," Laau Feagai said. "That's hearing it from the horse's mouth. That's an honor." Salanoa takes pride in the academic excellence of his players, and they respond with results. That's what happens when the favorite hangout of many Rams is the school library. "He brought the tradition back. He's taking the school in the right direction," Laau said. Ramsey's mother, Ola, is a Radford graduate. "Everybody on the team tries to beat each other in GPA," she said. Ramsey may be prouder of his team's grade-point average than its championship. "We had a 3.0 GPA as a team," he said. AS THE SECOND of four children, Ramsey shares the same gentle, laid-back countenance of his parents. Though Laau's black truck bears a sharp black-and-silver Oakland Raiders sticker on the rear window, it is Ola who often gets the final say. Mom wants Ramsey to stay home. Her oldest child, Tiana, has been attending college in American Samoa the past two years. "I want him to stay home because all of us can go see him play," Ola Feagai said. "I earned that right, at least until he's married. Then he's on his own." Ola and Laau first met at the Moanalua Samoan Congregational Church, which has since been cleared away for a Navy facility. They were high school sweethearts; Ola with the winning smile and Laau with the athletic prowess. Nowadays, on Sunday mornings, she heads to the Leeward Coast and plays organ at Waianae Congregational Christian Church. "I drag them to church with me," she said of Ramsey and younger brothers Ransen, a freshman at Radford, and 5-year-old Trey. Hitting "The Good Book," as well as the school books, is a tradition in their home. That's why Salanoa enjoys talking about Feagai so much. "Education is big on his list," said Salanoa, who set passing records at Division I-AA Eastern Washington before taking over as Radford's football coach at age 24. "The opportunity to play football at the next level is icing on the cake. To have universities to pay for his school, that's just a plus. "Ramsey has a big family down here in Hawaii, which could be something that could keep him home. I've been away, and it depends on each kid and what they feel in their heart. You're the one who will live with it for the next five years." Radford's success in recent years reached a pinnacle with a run to the finals of the state D-II title game. A number of Rams have potential to play at the next level, including running back Alex Daniels, Scheuring, tight end Mike Goodman, defensive ends Vasa Kuresa and Russell Wantowski and defensive back Trevor Maldon. Still, the longtime high school powerhouses in Hawaii get the first looks from recruiters. "I think they go to the big-name schools, and it's rare for them to offer to somebody from a small school like Radford," Feagai said. Although Feagai easily meets the standards for NCAA Division I eligibility -- a 3.5 GPA and 1100 on the old SAT -- he isn't holding his breath, waiting on more scholarship offers. But it is quite possible that more calls -- and knocks on the front door -- are coming in the very near future. Until then, an agile mind will keep Feagai's hands and feet quite busy.